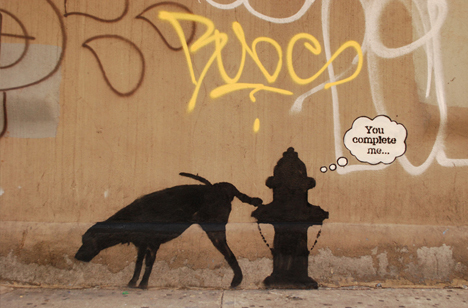 Making his way through the boroughs of New York, the infamous but mysterious interventionist Banksy is broadcasting new stencils, installations and mixed media work all month as a street-artist-in-residence in America’s largest city. 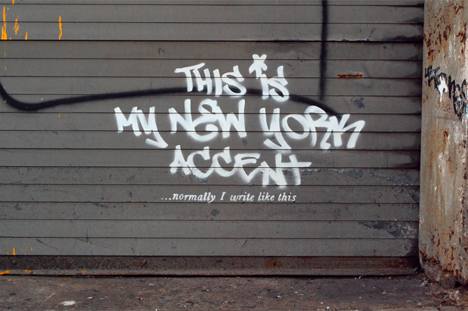 In Midtown Manhattan, his figures, phrases, plays on words and signage can be found defacing (or at least: refacing) concrete walls and garage doors in Banksy’s typical self-referential style. 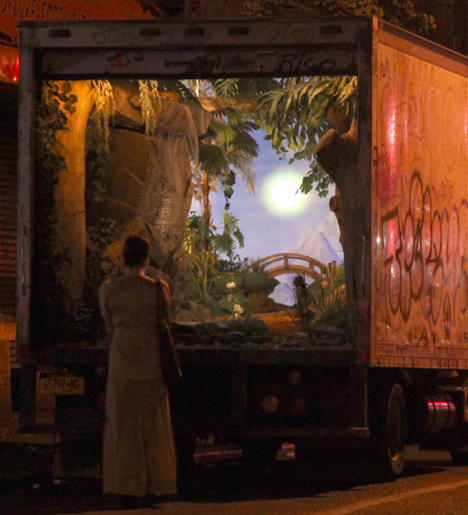 From there, he has moved onto Williamsburg and other Brooklyn neighborhoods, and no one knows quite where he will pop up next. 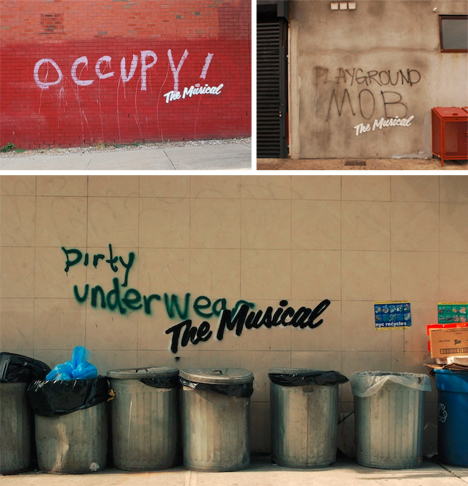 As he often does in new destinations, Banksy is actively toying with New York City culture and tropes, from its stylized graffiti fonts to its world-famous Broadway shows (his contribution to existing tags above: “The Musical” stenciled alongside each). 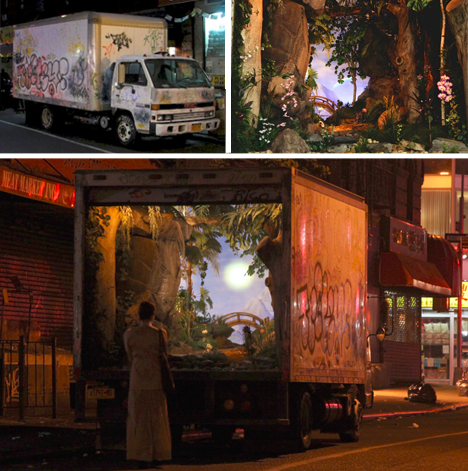 Branching out from two-dimensional pieces, here is “a New York delivery truck converted into a mobile garden (includes rainbow, waterfall and butterflies).” This piece in particular is also actually moving around the city: “The truck will visit a different location every evening from dusk,” starting in an East Village location. Perhaps best of all, this time Banksy also provides wonderful faux-vintage commentary on this series (titled: Better In Than Out) in the form of audio tour files you can click to play on Banksy’s website – or by calling a special toll-free number found spray-painted next to a number of these pieces: 1-800-656-4271. 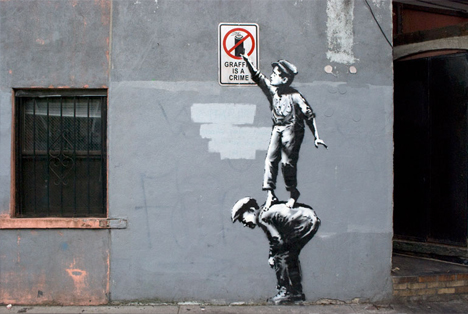 Of course, as always and almost as quickly as they appear, many of his works are being erased or defaced by city workers or other street artists – it goes with the territory.